A small appetizer illustrated with still images and video clips. For an avi video version, click here. Strangely enough, water bears are at the same time among the most unknown and the most fascinating creatures on earth. They have successfully escaped man's exploitation of nature and still can be found almost everywhere on earth. Scientists have reported their existence in hot springs, on top of the Himalayas, under 5 m layers of solid ice and in ocean sediments. Many species can be found in a milder environment like lakes, ponds and meadows, others prefer stone walls and roofs. But their most typical homes are moss cushions. I spent some time in nearby mushroom-smelling forests, scrutinizing mosses on rotten trunks in an avid search for water bears until I came to the simple conclusion that they can be found virtually everywhere - normally just one or two steps out of your front-door.  can revert to an "instant coffee"-dry state which resists storage in liquid nitrogen, contact with mineral acids, organic solvents, radioactive radiation and boiling water. After this kind of brute "scientific" scrutiny the miraculous creature is still able to return to normal lifeit needs only a small droplet of water! J.A.E. 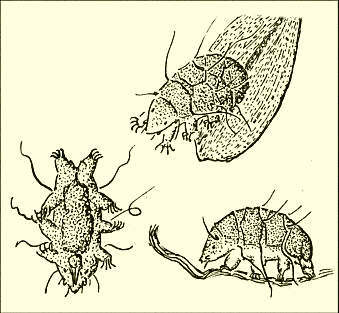 Goeze, pastor in Quedlinburg, Germany was the first person who published a paper on water bears. In 1773 he notes in his book; "Strange is this animal ... because it resembles a bear in miniature"2. About 100 years later, in 1867, Gustav Jäger publishes a book about microscopy where he describes the water bear as "One of the most miraculous creatures"3. Again about 100 years later, in 1969, Alfred Kaestner characterizes the water bears as "Strange miniaturized water animals"4. Hartmut Greven, one of the few water bear specialists worldwide, in 1980 publishes a book about water bears with the following remark on the dust cover: "Some have heard about them but only a few have ever seen them"5. In accordance with the citations above, many of the water bear pictures in earlier scientific literature look like an overstated funny joke. As examples I have reproduced below three pictures of water bears from Ernst Marcus' beautiful books; "Bärtierchen (Tardigrada)" (Jena 1928) and "Tardigrada" (Berlin 1936). There are several reasons for the fact that we have only relatively few light microscope photographs of water bears in the literature and on the Web: water bears have a thick cylindrical body and they walk on their legs. So, when looking at them from above, there will always be a problem with depth of focus. Water bears cannot be harshly fixed and flattened by the pressure of a cover-glass because they would disintegrate and die at once. Moss cushions are miniature jungles which cannot be easily investigated under the microscope. Furthermore, some species cannot be kept easily in water for more than one day.  you will see a real mouse-like or frog-like animal face and perceive the colour of the eyes, whereas the scanning electron microscope (SEM) reveals only a grey skin.  water bears can have wonderful body colours (intense red, orange, even green) and therefore are a good object for microscopy in incident light.  the SEM is able to show tiny details from slices of the inner structure of freshly killed animals, a procedure which perhaps might be justified for scientific reasons. In contrast, the light microscope shows everything without killing and dissection, including the inner organs in motion. 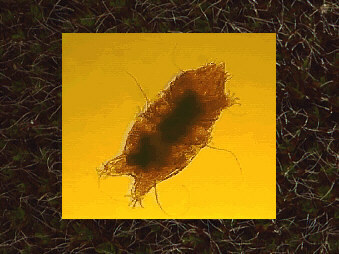 After the investigation the water bear can be replaced into his or her moss cushion home. Water bear, water bear! Where are you? Come out of your dark moss! Red Echiniscus sp. 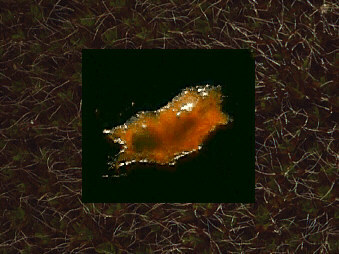 water bear in incident light at low magnification (length about 300 microns). The main actor of this animation lived in the depicted moss cushion left and hopefully lives there still today as I have put it back on this very moss cushion after the filming. Movement study of a water bear (approximate length about 300 microns). 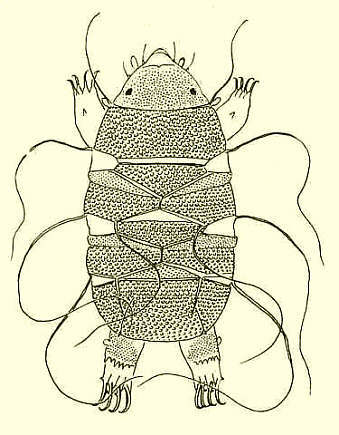 The eyes, most of the eight legs, the claws and the mouse-like nose area are visible. Water bear portrait (Echiniscus sp.) in transmitted light at high magnification. Image width about 100 microns. Note the impressive head with the red eyes and the dangerous claws. The claws can move in a smooth motion very similar to the movements of a cat. 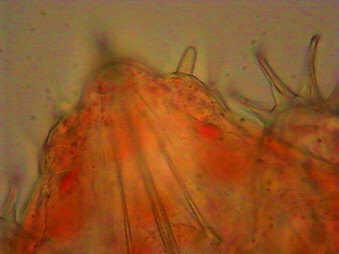 Furthermore note the two stylets which are used by the water bear to prepare its plant cell meal. 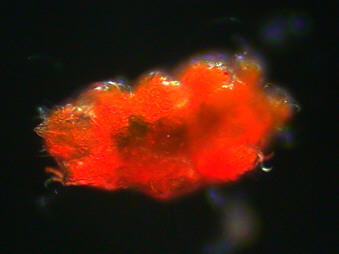 This water bear has a colour which might make a cherry seem a rather pale red. The dimensions of the well-fed animal are definitely beyond focus depthjust take it as a colour impression. 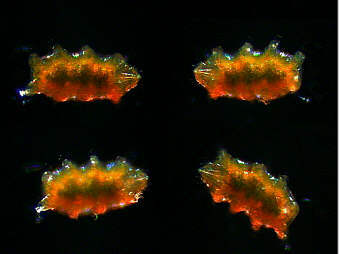 Montage of 4 water bear photographs taken at low magnification in incident light. The length of the water bear is about 300 microns. You will find a good introduction by David Walker to water bears in the 'Micscape' article 'Hunting for bears in the backyard'. Practical hints about how to collect them are included. Comments to the author Martin Mach are welcomed. 1 A. Kaestner: Lehrbuch der Speziellen Zoologie. 3rd edition, Stuttgart 1969. Volume I. Part 1, p. 588-597. 2 Joh. August Ephraim Goeze: Herrn Karl Bonnets Abhandlungen aus der Insektologie. Supplement by the translator J.A.E. Goeze, Halle 1773. The original text in German language is: "Seltsam ist dieses Thierchen, weil der ganze Bau seines Körpers ausserordentlich und seltsam ist, und weil es in seiner äusserlichen Gestalt, dem ersten Anblicke nach, die grösste Ähnlichkeit mit einem Bäre im Kleinen hat". 3 Gustav Jäger: Die Wunder der unsichtbaren Welt. Berlin 1867. The original text in German language reads: "eines der mirakulösesten Geschöpfe". 4 A. Kaestner: Lehrbuch der Speziellen Zoologie: Band I: Wirbellose. 1. Teil. Original text in German language: "Die Tardigraden sind sonderbare, wasserbewohnende Zwergformen ..."
5 Hartmut Greven: Die Bärtierchen. Wittenberg 1980. Original text in German language: "... eines jener faszinierenden Lebewesen, von denen manche gehört, die aber nur wenige gesehen ... haben." Published in the June 2000 edition of Micscape Magazine.